When it's time to consider renting your home near Fort Meade including the cities of Odenton, Severn, Crofton, Gambrills and Piney Orchard you'll want to check in with us first. We offer a free market value analysis to show you what homes like yours are renting for. We are also very active in the rental market and can tell you what the current trends are, when you can rent above "normal" market value and when things are a little sluggish. With the influx of employees and service members to Fort Meade and NSA there is demand for great homes for rent year round. Let us help you reach the largest audience of home renters possible to find you a great tenant. The members of The Roskelly Team are the definition of professionalism and integrity. After working with several other agents that only had their interests in mind, we made the switch to the Roskelly team and it was like a breath of fresh air! They provided us invaluable information and asked pertinent questions to help us find the right home. If you want an agent that's looking out for your interests, look no further. Laura Roskelly and Jessica Hood helped me sell my home in Piney Orchard. From the day I contacted the Roskelly Team I was impressed. Things moved quickly and smoothly with selling my home (and buying a new home in the same community) thanks to their professionalism and that of their entire team! My house went on the market quickly and sold in 5 days with multiple offers. I could not have been more pleased. Laura, Jessica, and their staff were in constant contact every step of the way through settlement day. This was so reassuring. Thank you Roskelly Team for everything! I will definitely recommend you to others. The Roskelly Team worked with my husband and I to sell our townhouse in record time during a very difficult market. We had spoken to 3 other realtors who were unsure that our house would sell at all let alone for the price we needed to get for it. Laura and her daughter Jessica, were incredibly confident that we could sell AND after seeing the condition of the house told us that we should list it for higher then we were expecting. Jessica gave us very realistic expectations about how quickly and how likely we were able to get the asking price. Jessica and her staging assistant Angel staged our very kid centric house so that it looked beautiful and professional without taking out all of the necessities that come with having kids, toys, chalkboard walls, etc. When it came time to show the house our family was prepared for weeks of showings and were pleasantly surprised by the contract(for just under asking price) in hand just three days later. Laura personally oversaw every step of the selling process to be sure that there were no issues on closing day and that every detail was handled with care. I can't recommend the Roskelly Team enough for all of the hard work that they do in the real estate market. I've never felt like a sales commission was so honestly earned. Amy Sanders began working with my family weeks before we moved to the greater Baltimore area. She took the time to learn what my family and I needed out of a home. We were expecting a new child within a month of moving, and even though we were on a tight schedule, she never used that to push us into a house we weren't completely happy with. Because of her dedication to her job and to our family, we found a great house that we would never have found without her guidance! Thanks Amy!!! As a military family, it was great knowing we were working with someone who was also part of a military family. We truly felt like we were part of the The Roskelly Team. Thank you for what you have done for our family! Amy Sanders helped me find a rental home that would suit both my price range and let me find a nice place for my dog. I moved from NY to MD and I didn't know the area. Amy helped me, find a good area and she made me feel so welcomed here in MD. She was always very patient and accommodating. If the home I was looking at wasn’t what I wanted, we just looked at some more. No pressure. I really appreciated everything she has done to find me a perfect rental property for me. Tom Roskelly was absolutely wonderful in guiding us through the process of buying our first home. Tom was a pleasure to work with, extremely professional yet down to earth, approachable, and friendly, and made us very comfortable during what easily could be a very stressful process. As first time home buyers we had a lot of questions and Tom answered them all very patiently and responded to our endless phone calls and emails extremely promptly. One of the best things about working with Tom is that he really seemed to care about us finding the home that was right for us. He was always willing to offer his experienced perspective when we asked him to but he never tried to push or sway our decisions. He listened to what we said we wanted out of a home and helped us find the perfect match. And once we found that house and made the offer we couldn’t have asked for a better advocate than Tom. He was on top of it every step of the way looking out for our best interests throughout all the negotiations, inspections etc. We have now been in our house for over two months and couldn’t be happier. We have already referred a friend to Tom and will continue to do so anytime we hear of someone wanting to buy a house. If you are looking to purchase a home and want to be in professional, capable, and extremely trustworthy hands then you want Tom Roskelly. Thank you so much Tom! Laura Roskelly and Jessica Hood, better known as The Roskelly Team of Re/Max, have made the recent sale of our home and the subsequent rental of a nearby townhome a worry free and effortless process for us. When we moved to the area ten years ago, Laura was our realtor and because of the exceptional service she provided then, we decided to contact. In May, when we made the call to the office to set up an appointment with Laura to see what we needed to do to start the process, she recognized my voice and the conversation flowed like we had been in contact every day for years. She is a wonderful lady, as is Jessica. When Jessica came to talk with us, she presented us a through market evaluation of our home. She made suggestions, in a very professional manner, as to what we needed to do with certain areas of our home to make it show well, and assured us it would sell. After the final decision was made to list our home, Laura and Jessica, with their incredible staging techniques, made our home beautiful almost beyond recognition. They then took amazing pictures for their website. We have never seen pictures of listings on a website that would ever compare with ones taken by Laura and Jessica. Because of their expertise, their internet posting was wonderful and we were sure it would attract a home buyer looking for that “special home”. We were signing a contract within TWO days after the home was listed. During the entire process, the service provided by Laura and Jessica was impeccable. Every question was answered accurately and every phone call and email returned promptly. We were kept informed of every aspect of the sale. When it came time to rent a townhome, they were absolutely key in helping us find a suitable townhome and also helped with the application process. We could not have done this without their help and would HIGHLY RECOMMEND The Roskelly Team to anyone thinking of buying or selling a home. When we get ready to relocate after retirement, we will once again contact Laura and Jessica for their outstanding help. Thank you, Laura and Jessica. We feel you ladies are definitely a part of our family. Laura & Jess, It was a pleasure working with you! I can't believe how easy you made the sale of my Dad's home. All the headaches were taken care of by you and all I had to do was say yes or no! Your "concierge" service, from listing to settlement, was perfect with no details left out at that last minute. I truly felt that I was kept informed of what was going on and I did not receive any surprises. Having sold Real Estate myself many years ago, I can truly say that you and Jessica are the best Realtors I have met. Thank you so much for all your hard work. It was very much appreciated! Hi Laura, and Jessica, Bryan and I would like to thank you and Jessica for your service in selling our home. all the way and were proactive throughout the entire process. Selling a home is very stressful, but you both were so reassuring and you really came through for us. I would highly recommend you to anyone wishing to sell their home or purchase a home. You are a great team and I wish you the best of luck. We feel your little card in the mail was a sure blessing. I worked with Jessica in the past to find a rental home. We were a military family that relocated here and she was on the ball to show us all rental properties. She was very courteous and always on time. She assisted in answering every question I had no matter how big or how small. (And trust me, I have a million questions all the time) So it was no surprise when we decided to purchase our "dream starter home" that I immediately emailed Jessica. By the end of the next day, she had sent over a list of several homes that fit our exact description. With my husband in Afghanistan at the time, she worked extra hard to include him on all conversations and take into account the time change. She was very knowledgeable with VA rules and uses of power of attorneys for contracts. Within days we found our perfect home. Throughout the contract process, she went over everything line by line and helped me understand what I was signing. Every part of process, Jessica was there. She never left our side and always made sure that our best interests were at the forefront of the process. I recommend her to EVERYONE I know. In the future, should I decide to sell and buy again, Jessica will be my first and only call. Thank you Jessica for everything that you did for us. It is appreciated more than you will ever know! I can't say enough about the Roskelly Team. They helped make the sale of my home in Piney Orchard seamless and stress free for me. I am a recent widow, and the decision to sell was not an easy one. They did all the thinking for me, supported me throughout the whole process, and sold my home within a short time! The one thing I appreciate about them, besides their top notch real estate savvy and knowledge, is that they are approachable, friendly, yet so professional with a strong sense of ethics all along the way. This is not easy to achieve. Both Laura and Jessica are such terrific people to work with, I would recommend their services to anyone wishing to sell their home. In this current market, it is a rough industry to be in, yet they are doing it successfully! It is all due to their talent and knowledge that they are still making it happen for people like me. You can't go wrong with the Roskelly team! Dear Laura and Jessica, I want to thank you both for your help with the sale of the condo in my sister's estate. As I live out of state I was worried that the sale would be a difficult process, but your team made it very easy. Jessica's knowledge of the market helped me price the condo competitively and her staging work made the place really stand out. The long distance did not effect Laura's efficiency with the paper work. Everything was completed smoothly and quickly. The whole settlement took less than 30 minutes, because everything was done right! Communication throughout the process was excellent. You were both professional, but personable. Your organization, energy, attention to detail, and the way you addressed every issue immediately sets a high standard for the rest of the industry. The extra effort you both put into checking on the property and helping with the furniture disposal really put me at ease. Thank you both for a wonderful selling experience. We wanted to let you know how thrilled we were with your service in selling our Gambrills house. From the very first meeting to the very end, both of you made the whole experience painless. Your professionalism and knowledge of the market in our area gave us confidence that we would be able to sell our house quickly and you delivered! With your track record of selling at least two other homes in our neighborhood each within 7 - 10 days, we had all the confidence and firm belief you could add our house as #3 on your record. You informed us that it would be hard work, but together we met our goal date of putting the house on the market 45 days after we met and you selling it in two weeks. We count our blessings every day and firmly believe that you and Jessica are the miracle workers in the real estate industry. You continued to do an outstanding job with the final negotiations and guiding us in the right direction. As a result of listening to you, we were able to sell our house for a fairprice which enabled us to enjoy the next chapter of our lives in Texas. Thank you again for your help and most of all just being good and honest people in helping others sell there homes. When it was time to sell our home we were filled with uncertainty and a little apprehension. The Roskelly Team took our apprehension and uncertainty and turned it into excitement and success. They knew what was great about our house and reminded us why we loved it and bought it many years ago. They helped us envision a young couple or family starting out in our home. Then they helped us transform our space with a few updates and staging materials. It was like living an episode of a staging show on TV. Jessica and Laura really do have an eye for what is stylish and are able to accent the space in a way that the buyer can relate to. In addition they took on many of the annoying and time consuming responsibilities that go along with selling a home like gathering information and preparing paperwork. They made us a part of every step and made the process easy and comprehensive. The Roskelly Team did not just see us as a client; they saw us as a family. They were accommodating to our needs. We have a child with severe developmental disabilities and they worked around her needs. They respected our situation. We never felt uncomfortable or as if we were compromising the needs of our children in order to sell our home. They did a superb job marketing our home. The pictures they took and brochure they created were high quality and showed off the best features of the home. The internet listing really stood out from the rest. The team was always available to us and willing to work hard to get the house sold. Our home sold quickly in a struggling market. This is a team of professionals who have experience and talent. They take pride in their ability to deliver and get the job done. They are talented stagers who understand the market and what the buyers want. Most of all though they are a family just like us and they care about their clients. Diana and I wanted to thank you for all your help. We are very happy withour home and can't wait to make it ours and move in. We didn't think this day would come! There was a reason I kept your information for 2 years while we lived in our apartment. I knew that you were someone we could trust and would lookout for our best interest. Your honesty was much appreciated. It is quite obvious that you enjoy your profession! Angela was awesome and a joy to work with as well. We knew if we had a question or a problem she would be right on it with an answer or a solution. If I get the chance to recommend you and your team, I certainly will. Dear Jessica, Laura, and the rest of the Roskelly Team, Thank you!!! I just wanted to express again my thanks to your team for all of your knowledge and skilled, enthusiastic help and support throughout the process of selling my home. Jessica, you truly went above and beyond in helping me, despite my crazy schedule...I don't think I could have found another realtor who would have accomodated me the way you did, always with a smile. You priced the home spot on, and staged and photographed it beautifully and tastefully, really showcasing the strengths of the house for buyers. Everything was handled so professionally, and the pamphlets, website posting and even the yard sign were appealing. Your team handled everything smoothly, and were always available when I had a question...I truly felt like everything was in good hands, and I didn't need to worry about anything. You made the process as easy and straightforward as it could possibly have been, and I think that getting a full price offer in less than a month really attests to your knowledge of the local market. In short, thank you again for all of your help. I am so glad to have chosen to work with you during this process. Laura and The Roskelly Team are easily the best realtors we have ever worked with. They always made us feel like we were their top priority. Even though we were not living in the area at the time Laura and team always communicated with us and made sure we were kept in the loop. Our past experience with other realtors were very disappointing. They did not protect our interests or failed to help us when the going got tough. Laura was there 110% of the time, looking out for us, ensuring a smooth negotiation and helping us with last minute complications. We provided a huge challenge for Laura with a complicated short sale and she took on the challenge and proved she is more than capable of coordinating the entire transaction. I had enlisted the help of a 3rd party short sale 'expert' but Laura proved that they were unnecessary in the process. I can't say enough good things about Laura and her team. We have used The Roskelly Team to rent, as well as, sell our property in Crofton, MD. Even though the property was vacant they staged it to make it look show worthy. I would highly recommend Laura to anyone that is looking for an expert realtor that is not only professional and capable but also a pure joy to be around. As a person selling from out of state, this team is God sent. Trying to sell my Crofton home from hundreds of miles away, The Roskelly Team was invaluable to me. From the moment I met them - I knew that they would be a pleasure to work with. They get it done! I cannot say enough good things about them. Their enthusiasm is infectious. Thank you so much for your hard work and seeing this sale through to the end. I would not hesitate for one minute to ask you to sell my home again or give you as a reference. The Riley family has been waiting to exhale for the last year. Struggling with a horrendous housing market and juggling two mortgages. Thanks to the pride and professionalism of The Roskelly Team, our worries were put to rest. Laura, you and your crew are miracle workers! You were able to quickly assess the property and market with stunning results. We were astounded and amazed that in less than 7 days on the market we had already received multiple showings and a great offer.This was a far cry from the 5 months the property languished on the market the previous year. If it wasn't for your vision, meticulous attention to detail and phenomenal home staging skills, our home sale would not have been a reality. The Riley's will speak your praises for years to come and you can rest assured we will refer you to all of our friends that are moving to the area. Thanks again for an outstanding sale. We just wanted to let you know how happy we were with your representation on our home sale. We appreciated all the communication and feedback. The staging, in such a difficult market, made all the difference. Your expertise transformed our home and really made it stand out. We only wish that we had you represent us from the start. We have recommended you to others and because we spoke so highly of your work, the sales representative from our new development is recommending your team to people in the area. A special thanks to Laura and Jess! Having worked with Laura in the past I knew that when it came time to sell my home and sell it quickly, she was the person to get the job done. I was provided excellent customer service throughout the entire process of selling my home. Laura and Jess worked wonderfully together in addition to working with me. They did an excellent job of staging my house so that it photographed and showed beautifully and they kept me apprised of all the daily details throughout the sale and settlement process. Their professionalism, sincerity, guidance and assistance was very much appreciated! These traits are very hard to come by these days and they go above and beyond what it takes to get it done. I can’t thank you enough. I will always recommend The Roskelly Team to my friends and family! Thank you so much for your hard work and dedication! You are the bomb! Military relocations are always hard; Thank goodness we found The Roskelly Team! Even with a tough market, their marketing and professionalism made the difference so my husband and I wouldn't spend too much time apart while transferring duty stations. They went over and beyond when it came to communicating with us. It wasn't just a for sale sign in the front lawn; it was the whole process and marketing strategy from the Roskelly Team that really got us sold! We would highly recommend The Roskelly Team if you want to sell your house!! They are a GREAT team to work with!! Our Sincere Thanks to you! This is a short letter of gratitude to the PHENOMENAL Roskelly Team. They were an absolute GODSEND during the entire process of my husband and me selling our Maryland townhome. My husband is in the military and we had already relocated by the time the house was put on the market for sale a 2nd time. Laura and her team facilitated everything with expedience and the utmost professionalism. We could not have sold our townhome without them. And the cool thing is that we did it all without ever having met Laura or her team face to face. We had to completely trust Laura and her team to work on our behalf and could not have been any happier with the way we were treated. My husband and I had an unfortunate experience with a previous realtor where we were left feeling like ¡§just another listing¡¨, where calls were not returned and emails not responded to, and we HAD met that realtor face to face. Not once did we EVER get that feeling from Laura or her team. Everyone was very helpful and responded to every little question we had, regardless of how trivial it may have seemed. Laura and her team were very knowledgeable throughout the entire process and were the GURU¡¦s in navigating the waters of our unique sale (I just LOVE when my team has more knowledge than the otherƒº). We just cannot say enough how much we so appreciate EVERYTHING they did for us in the short time that we were privileged to work together. We began working with Laura and her team to sell our property in mid January and the property was sold in early April. Wow. That was FANTASTIC, considering the state of the market at the time where properties were sitting for months and months at a time. This just goes to show that Laura and her team were diligent in their efforts and worked tirelessly to ensure that our outcome was successful. Thank you, thank you, and thank you!!! Even after we closed, Laura and her team continued to assist with tying up some of the loose ends that came up. Laura Roskelly and her team are a rare breed. They are the type that works for the CUSTOMER and not just for the commission that they are to receive in the end. And Laura, we noticed. Thank you so much for all of your efforts. If we are ever looking to sell again, you will be the first one that we call (so, you need to start working on becoming licensed in North Carolina!). When it came time to sell our family home, we didn't know where to begin. How lucky we were to receive information from Laura and the Roskelly Team. From the very first meeting with Laura, we knew we would choose no one else. She and her team were prepared and answered any questions we had. Throughout the whole process, we continually received fantastic service, guidance and advice on getting our home ready to sell. Saying that her team gave 100% would be an understatement. We truly believe that they were the reason our home received a contract after being on the market for only 14 days. Though they had other clients, we always felt we were a top priority. Even the supporting office staff went above and beyond to help us with the sale. We would highly recommend the Roskelly Team, without hesitation, to anyone with real estate needs. In uncertain times, the Roskelly team brought to the table the confidence and experience to make the home selling process experience a seamless and easy one. I would and will recommend them to anyone and everyone! Thanks Laura and Jessica!!! When it came time for us to sell our first home it was nerve-racking. We had already been through one Real Estate Agent and that was a complete disaster. Unfortunately when we decided to sell and purchase a larger home the economy and housing were on a fall, but Laura and Jess were there for us from the start! When we met with them for the first time they were organized and prepared with comps from our area. They told us exactly how it was going to work, and they never mislead us in anyway. Laura and Jessica made sure that the house was staged perfectly with all the little details that no other agent ever took time to do. They purchased the staging props and made the house beautiful. Jess took the time out of her day to take me around the area to look at our competition. We went through 6 different homes. She wanted to make sure that we knew what we were up against and that our home was the best looking, and it was! Laura went to extreme measures to make sure that the pictures were perfect and took over 100 different shots. The website and the brochures were magnificent! The website had tons of pictures of the house which gave buyers ever angle to make sure that was the house for them. In our personal web page they wrote everything that they had done from getting the house ready and staged to sending us the address for the closing, they were always making sure that we were in the loop. The brochures were like nothing I had ever seen before, they were beautiful and very professional looking. Laura and Jess always kept everything stocked up and well maintained. Needless to say the house sold in less than 25 days!!! We were thrilled! Never did we expect such a wonderful turn around date. The Roskelly Team did it again! Jess and Laura became family to us and we will always recommend them to others. From the beginning Laura & Jessica were on time, organized, informative, considerate to what we had to say, friendly and caring. Laura spent several days visiting comparable homes in and around my area to help us determine a value. Other realtors that I had interviewed wanted to give me a selling price for the home without even seeing it or viewing the competition. Laura showed us the low end to the high end comparables and then told us to choose a price. We wanted a quick sale since we were moving out-of-state and asked for her advice in pricing the home. We all agreed on a quick sale price with Laura's expert knowledge of the market. The Roskelly Team knows how to market a home and stay on top of things from using up to 40 different Internet listing sites, beautiful mailings, their constant accessability, knowing the market, pledging to always keeping the info box full, keeping us informed of every detail by creating a personal web page for us on which we could see every detail daily of what was going on with feedback from the showings, to everything they were doing to market our home. Last, but not least, is the beautiful brochure they created for our home. She spent several hours at my home making sure that each picture was perfect. The brochure was created a few days later and was so lovely and top quality that I didn't recognize how beautiful my home truly was. With Jessica and Laura's attention to detail, expert pricing, caring and helpfulness to the seller, OUR HOME SOLD IN 20 days in a down market to a wonderful family! Our neighbors were so impressed with the quick sale of our home and The Roskelly Team, that if they sell, they claim they are going to hire The Roskelly Team! What a pleasure it was finding and buying my new condo. I have been in it for two months now and every day I am reminded that I have made the right decision to move here. Thank you so much for making this happen. From day one, when I found you on the internet, you were there with me every step of the way. You allayed my fears and concerns and assured me that everything was going just the the way it should. It is hard to believe that it was only two months from the day I decided to look for another condo until I moved in to my new home. I know that it was due to hard work and dedication on your part. I fell in love with the first condo you showed me. I was offered to be shown others but I knew from the beginning that this was the one for me. Jessica helped me get my condo on the market and and I made an offer within days. Tom found a buyer who fell in love with my condo. Having you all work as a team definitely worked to my advantage. Your help with financing and settlement was immeasurable. Pete and his team from First Horizon were wonderful and the settlement was the quickest and easiest I have ever experienced. Thank you all again for everything. I feel like I have become part of your family and I recommend you to anyone who tells me they are looking for a new home. God bless you all for your care and concern. Being the president of the Severn Woods Homeowners Association for almost a decade, I had the opportunity to observe property sales within my community and the realtors representing the homeowners. When it came to selling my house I choose The Roskelly Team based on three simple observations. The Roskelly Team knows how to market a home via multiple media options, is accessible and stays in constant contact with the buyer, prepares and shares continuous market comparison data to enable me the buyer to respond to changing market conditions. In the current market environment, I have learned that the above attributes are critical in achieving a successful sale and I highly recommend The Roskelly Team to you the prospective client. During a difficult real estate market with a record number of homes for sale in our area, the Roskelly Team did a splendid job in marketing our home, we soldin 5 days for $5,000 over our asking price. We selected the Roskelly Team to sell our house, and we were not dissapointed. You guys are really great realtors and we are very happy that you helped us buy and especially sell our first home. 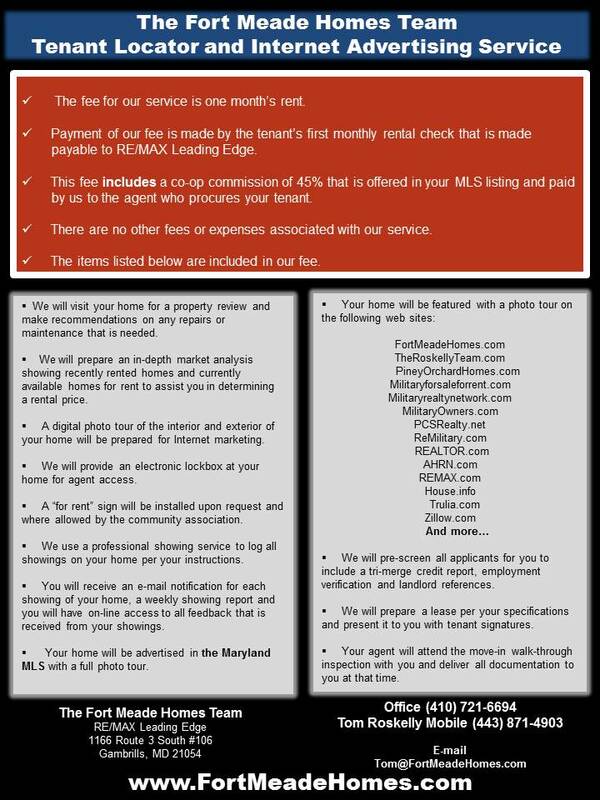 We will recommend you to everyone that we know looking to buy or sell a home in Maryland. We only wish you could be our realtors here in Arizona when we buy our next home. Thank you for everything. When I decided to sell my home I called The Roskelly Team. I was impressed with their knowledge and experience of the housing market. Laura and Jess were willing to help me declutter my house to get it ready for sale. As a first time home seller they put to rest all my apprehensions. I didn't know what to expect in a changing/slow market but my home sold in 30 days for the asking price and closed in 2 weeks. The flyers and website pictures were beautiful. Laura and Jess are very down to earth and willing to go the extra mile. If I ever have to sell or buy again I know I'm going to call The Roskelly Team. The Roskellly Team's experience, expertise and work ethic was crucial in navigating a turbulent market. Laura understood and expertly communicated what was required to make our townhouse rise above the competition. Her attention to every detail, from preparing the home, conducting ongoing market analysis, and assisting in all aspects of closing settlement helped get us the result we wanted. In addition, Laura and her team always kept us up to date through on-line postings on our personal website which Laura provided and frequent phone conversations. Laura and her team truly went above and beyond our wildest expectations and demonstrated an unrivaled standard of excellence. We can't thank you enough for all of your hard work on our Piney Orchard home! Thank you so much for the work you have done for us over the past seven years. You helped us buy our first house in a sellers' market and sell that house in a buyers' market. Through every step of the process, you helped us understand our options and guided us through the complicated details of buying and selling. Your responsiveness and calming prescence made both experiences enjoyable. Specifically, the help you gave us most recently in selling our house was instrumental in our getting our asking price, despite there being 30 or more similar properties on the market in our neighborhood alone. You met with us several times leading up to us putting the house on the market, telling us what we needed to fix up and what we could "let slide." Your market analysis and recommended price were right on. After we'd been on the market a few weeks, we drove around our neighborhood and looked at comparable properties and were very pleased to find that we were priced exactly right. We put our house on the market in the "slow" season -- January -- during a buyers' market and still sold in just over 30 days. Your final staging of our house really made it shine -- moving furniture and placing it in ways we would have never thought of and adding nice touches throughout. Everyone we showed your pictures to were impressed. I was also impressed with your pictures -- such a seemingly simple thing, but I saw some listings where the pictures didn't show anything and certainly did not help potential buyers preview the house. Not the case with our listing! Finally, thank you for your guidance as we received offers and negotiated for a final price. Your expertise really helped our nerves during that tense time. We have recommended you to several of our friends, all of whom have had similar fantastic experiences. We'll continue to recommend you to anyone we know looking in the area! We are just beginning to settle down in our new home and I just wanted to send you a line in order to say "thank you" for all of the services that you provided us in the sale of our Old Bay Lane property in Severn. We knew from the past that selling a home in the current market would be difficult. Because of this we interviewed and evaluated several seller representatives. This was done in order to receive the best results. You did not let us down, in fact, we were pleasantly surprised at the additional effort on your part that eliminated the pressure of selling our house in such a short time considering the downward development in the housing industry. From the inital interview to closing it was a joy to work with you. I have and will tell my friends, in the future, about your service and direct them to you. guys couldn't have done better! You've been 100% accessible, accomodating & have really made me feel like you care. I can't thank you enough! If there's anything I can ever do for you, please don't hesitate to call! Thank you so much for your help in selling our home in Quail Run. You guys did a fantastic job in a tough market and we couldn't be happier with the results. It's true...no one works harder than you do and we're glad we hired you! Thanks Laura and Jessica. It was great working with you both. We really appreciate all the work from listing the house through to settlement. All the work that you did staging our house made it look like a model home. We would not have gotten our asking price without the staging. With all of the houses on the market in The Provinces, we believe the staging made the difference. When it came time to sell our family home, we didn't know where to begin. How lucky we were to receive information from Laura and the Roskelly Team. From the very first meeting with Laura, we knew we would choose no one else. She and her team were prepared and answered any questions we had.Throughout the whole process, we continually received fantastic service, guidance and advice on getting our home ready to sell. Saying that her team gave 100% would be an understatement. We truly believe that they were the reason our home received a contract after being on the market for only 14 days. Though they had other clients, we always felt we were a top priority. Even the supporting office staff went above and beyond to help us with the sale. We would highly recommend the Roskelly Team, without hesitation, to anyone with real estate needs. The Roskelly Team helped us find our dream home in record time. As first time home buyers we were a bit apprehensive about the process but they lead us through each step with ease. When it came time to sell we again called on them and sold our house quickly in a super slow market. We can't thank you enough for your time and guidance on the preparation and sale of our home! Thanks so much for your professionalism and guidance through this transition. You are truly worth every cent and it was a sheer pleasure and comfort to know we are in your very capable hands. Thanks again for your hard work and dedication in helping us purchase and then sell our home! Laura Roskelly and her Team gave to us a level of in-depth & detailed, solid market knowledge, along with the highest level of professionalism that I have ever received in my several real estate transactions. Their honesty, positive attitude, and attention to detail thru every aspect of my home sale, from signing with them to the final settlement, really put me at ease and made the whole transaction a wonderful experience.Communication with me was top notch. They are wonderful, caring, and totally savy in the real estate business! Thank you Laura, and everyone on your Team! View our sales history here!